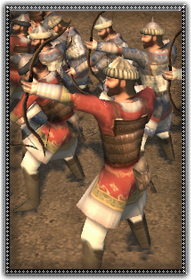 Persia has a proud history of archery dating back thousands of years. The Shah has sole access to this elite class of archers, and he would be wise to use them correctly, as in mellee they will quickly flee. Excellent archers, but weak in mellee.